Leah and Vanessa are creating comic books. Hi! We are Leah and Vanessa, the artist and writer team behind the exciting comic book series COURI VINE. The story follows a young person who is ridiculed for being different. As a infant, a tragic incident left COURI with a crippling lung disability. This action-packed adventure leads her to unlock the mystery of what happened on Earth to force refugees to the Moon, and what happened to her. Along the way, COURI discover her difference is actually a superpower! COURI VINE is an exciting story about girl power and being true to oneself. 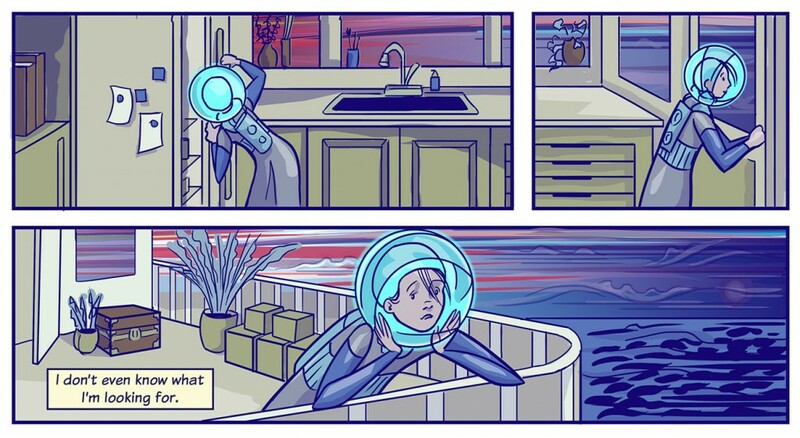 The story embraces multiculturalism, sustainability, disability, and what life might be like in a futuristic Moon City! Our goal is to complete the first story arch of COURI VINE in this epic 4-book saga. We're on our way! Available in print and on Comixology! You can read the first book FREE here! Join our Patreon. Be our Patron. Let's face it, there is an amazing amount of time and effort that goes into creating a comic book series. With your funding, we will have more time to spend making vivid and compelling art in each and every panel. We'll be able to pay expenses like month Adobe CC subscription, comic con table fees, and even hire a colorist. Your support will act as our propellor to help us get books out, faster! As our patron, you will have access to exclusive videos revealing start-to-finish the process of making art for the next book of COURI VINE. We'll fill you in on the process of making our comic book, everything from writing to making the final art for this exciting series. Your patronage will allow us the time to tell this tale and introduce this young girl to a world of discovery. We can't thank you enough for helping us reach our goals. We are excited to share this epic story with you, and take you behind the scenes as we bring COURI VINE to life! You'll you get a sneak peek of the comic being drawn from start to finish! 2 - 4 time-lapse videos per month with commentaries by writer, artist, and special quests! You will also have our sincere THANKS!! Get monthly desktop wallpapers, and all previous rewards. One signed digital poster coming your way! Plus, you will have access to all previous rewards and our sincere THANKS for helping us make COURI VINE! At this tier of support, you will receive books 1 & 2 the upcoming comic books as they are completed, including all previous rewards, and our most sincere THANK YOU! Tell me us your vision and artist Leah Lovise will make something just for you. With $3,000 per month, we can cover comic con fees, print books, keep our software up-to-date, hire a colorist, and spend more time developing art for this epic story and its array of characters. With your support we will achieve stability and consistency, making more COURI VINE books, faster. We'll have funds to create cool new merch! AND, with your help we'll be able to kick it into gear on all future endeavors. Thanks for your support!